We haven't checked in on a Steam system survey in a while, so let's fix that today. 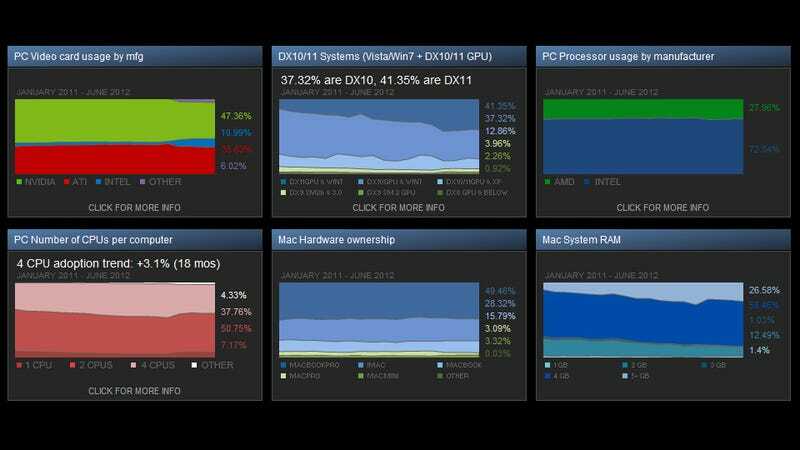 Every month, Valve publishes the results of a survey that drags in all kinds of information on its customer's computers, from what graphics card they've got installed to the kind of browser they're running. If you want to see if you're normal, it's a good place to look. Ditto if you want to feel like you're some kind of Glorious Master Race Übermensch with your fancy new GTX690. Me, though, I always like looking at the software side of things, because that's where the really interesting stuff is. Did you know, for example, that 3% of users don't have Flash? Only 40% have Skype? And that more Steam users have Winamp than use Google Chrome? That last one is going to keep me up all night. For the general state of the market, know that Windows 7 (64-bit) is the most popular OS, 72% of users have Intel CPUs, most people have NVIDIA cards and a whopping 14% of Steam users speak Russian.